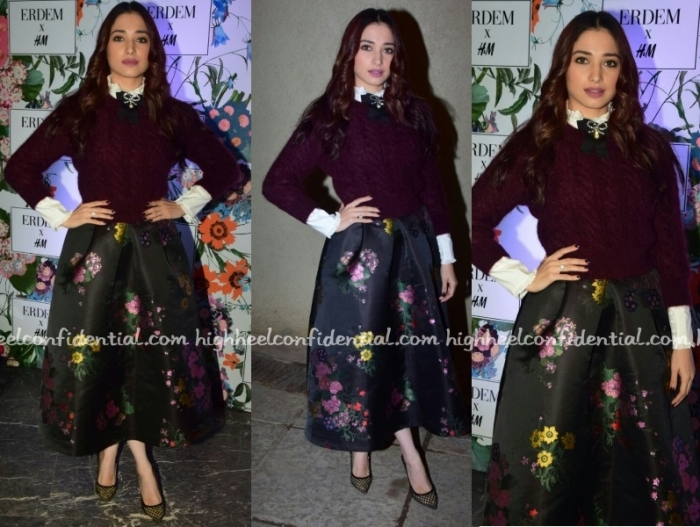 Wearing an Ohaila Khan dress, Tamannaah attended the designer’s collection preview on Wednesday evening. She looked nice. At the Erdem x H&M collection preview in Mumbai, Esha wore a fitted floral midi dress and pumps from the collection with a Jimmy Choo clutch. She looked good and I particularly liked her makeup here. Wearing a look from the Erdem X H&M colection, Tamannaah attended the preview tonight in Mumbai. Not much to complain about, she looked good! At Satya Paul’s Festive collection preview, brand ambassador Malaika was seen wearing an ombre leaf print sari with a black collared shirt and a statement silver necklace and ring from Apala By Sumit. Considering the pallu was draped as a scarf, the heavy necklace just looked out of place. And going by the frayed ends on the shirt, it felt like it was cut off to create the illusion of a cropped blouse. Would’ve preferred it if she’d worn the shirt in the longer version and with a pair of earrings. At Jade’s flagship store launch, Sayani leant her support by sporting an outfit from the label. Wearing her hair half-up, she rounded out the look with a diamond necklace and pair of metallic sandals. While she wore her look well, it was hard to look past the heavy-handed bronzer; bit of a downer that.